Hi everyone! I'm happy to present my newest Lego creation, the completely remote controlled K.I.T.T.! It is my third model at a bigger scale. The building was very interesting. 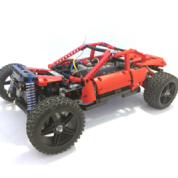 There were a lot of technical challenges with the chassis and the body shaping was difficult, too, because usually I make smaller models. Hope, that I can make more MOCs at similar scales in the future. There are a lot of Lego replicas on the net. For example I found out, that I use the black minifig shields for the wheels. After it I saw, that Firas has already done it! The working scanner and headlights aren't new, too. But! As far as I know, this is the smallest K.I.T.T., which contains these functions! Kitt has an enemy, called Karr. Karr was the first car, but he was evil. I built at first Kitt, but later it came into my mind, that it would be more interesting and unusual to build Karr. But almost everyone likes Kitt, and almost noone likes Karr. So finally I decided to put more Kitt scenes into the video and upload the car, as Kitt. I started shooting. I brought out to the street two reflectors, the car and the camera. There are scenes, where you can see two cars together. The truth is that I have only one. After every scenes I exchanged some parts of the body, and continued shooting, without changing the position of the camera. Later I cut the pictures near each other. But the screenplay allows you to decide, who wins! :) Despite the difficulties, I really liked to make this movie and like the result. Hope, you like it, too! The car is drived by an L Motor, with a gear ratio 1:1, through a differential. It is very simple, too. I used a Servo Motor. The other two functions are more interesting. I used two M Motors. If I push the button on the remote control, I start to operate both ones. One of them opens the lights, the other one switches them on. It is impossible to push and release the button fast enough, so I had to use slippery mechanisms. For the opening I used a clutch gear, you can see it on the bottomview picture. But at this level of cramming, there isn't enough place for a clutch gear everywhere, so I found out a new solution. Between the two connectors, there is a small piece of rigid hose. If the switch reaches its end position, the hose can rotate calmly further in one of the connectors, and the mechanism waits my reaction time. Two M Motors again. One of them switches on the light and the other motor, which starts to move the light. The switching mechanism is very similar to one of the pneumatic autovalve. After it changed the position of the PF switch, it rotates further and doesnt cause damage. The construction, which transforms the rotation of the motor to the linear motion of the red light, contains three liftarms. More pictures on my MOCpage! I think that's brilliant. I'm amazed you found the space for those lights in such a small model. Great, just great. I initially thought (he or looking at the video) how did he do the scanner? Your solution is simple but very effective. So how about the turbo boost? Cool. Mechanical solutions are always fun to watch in action. Nice model with good presentation...very cool! Great to see KARR for a change! Some clever mechanisms in there, and the scanner light came out nicely. Now... how about using PF to have it transform into Super Pursuit Mode!? Excellent! Just like the classic. Cool music and great way that you've incorporated all the funtions. Great job! Impressive how you crammed so many motors and functions in a model so small, and it was all worth it, for the headlights and scanner are by far the best parts. And the music was a great idea, my compliments to your friend. Clever mechanism, I am sure Bonnie would also love to service it! As commented on MOCpages....... wonderful job. Love all the functions... video is great as well. Marterpiece, I am surprised by the simplicity of the mechanisms. Thanks everyone for your kind comments! I'm very happy, that you like it! 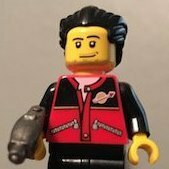 @TinkerBrick: Thank you! Don't worry about the turbo boost, Bonnie will put it into the car next week. @deraven: It's an early model, so that mode is still didn't exist. Oustanding work. Lots of functions in such a small set. And I am (also) amazed by the simplicity and cleverness of the scanner. I love mechanisms where rotational movement is converted into lineair motion. Thank you very much Jim! I'm glad you like it! I am sure Bonnie would also love to service it! Thanks for the nice comments! I really appreciate them! @JamesJT: Well I guess, that thing with the force and object was in an other movie. If I build a Tumbler in the future, maybe the video of it will show, what happens at the end! hall of fame material ! I really like the scanner light and the KARR version...well, I don't really like KARR, but I like that you built it!